Successfully Added MeeGoPad T07 Windows Micro PC - Intel Cherry Trail CPU, 4GB RAM, Fully Licenced Windows 10 OS, Wi-Fi, 32GB Memory to your Shopping Cart. MeeGoPad T07 comes with a licensed version of Windows 10 and has the processing power to let you enjoy all the multitasking capabilities of a fully fledged computer. The MeeGoPad T07 comes with an Intel Cherry Trail processor and an impressive 4GB of RAM. The quad core processor features Intel’s Burst Technology; this allows the CPU to deliver on demand processing power when you need it, and to conserve energy by running at lower speeds when its full capacity isn’t required. With Intel Gen 8 graphics it has about twice the performance of the Intel Atom chips and can keep pace with fast moving games as well as support all your multimode needs so you can enjoy all of your favorite films. There is 32GB of internal storage and a micro SD card slot allowing you to add an addition 64GB of memory you won’t be short of space for your media files documents and any apps that you may need. A fully licensed and genuine version of the Windows 10 OS comes preinstalled on this PC dongle so you have a smooth operating experience and instant access to all the tools you require for a complete and compact computer package. All that's left is for you to connect the power and plug it in to your TV’s HDMI port or monitor. To prevent any possibility of overheating the MeeGoPad T07 mini PC has four big air vents located around the top and bottom and a built in fan to direct the air as needed. The fan is hardly noticeable when running and will kick in to keep the unit cool when running at full pace. The MeeGoPad T07 has loads of connectivity including Wi-Fi 802.11n, Bluetooth 4.0, two USB 2.0 ports, HDMI, 3.5mm audio jack and a micro USB for power. At just 52 grams and not much bigger than a USB pen drive this pocket size micro computer is everything you need in a convenient compact package that slips into your bag or pocket when not in use. 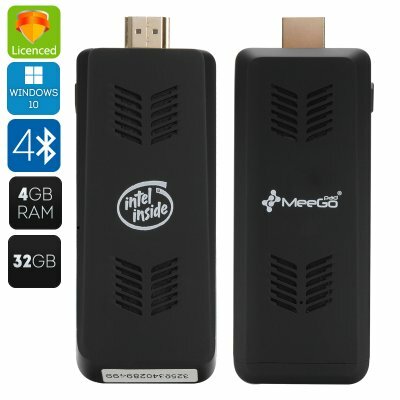 This MeeGoPad T07 mini Windows PC comes with a 12 months warranty, brought to you by the leader in electronic devices as well as wholesale micro computers and TV dongles..